You are here: Home / Business / Over 300 in Winterset for Grassley "town hall"
Over 300 in Winterset for Grassley "town hall"
Over 300 people turned out for Senator Chuck Grassley’s “town hall” meeting this morning in Winterset. “We’re here at a time when I sense people are scared for our country…and that’s why we’re having these big turnouts,” Grassley, a Republican, told the crowd at the beginning of the hour-long event. The last question came from a woman in the crowd who told Grassley she fears if health care reform passes, the government will get the authority to make end-of-life decisions for the elderly. Grassley told the woman her fears were justified. Audience members occasionally quarreled with one another, but none shouted Grassley down. Pamela Nicholas of Winterset was among those called on to speak, her voice rising as another woman standing nearby vocally disagreed. Without prompting from the crowd, Grassley, a Republican, defended his closed-door negotiations on health care reform with a handful of Democrats and Republicans on the Senate Finance Committee. Grassley told the crowd he’d been elected to work, not to sit in his D.C. office with his feet on the desk and that’s why he’s continued to work behind-the-scenes and make trips to the White House to meet with President Obama. A woman in the crowd holding a sign that read “Reform Now” was standing near a woman who was called upon to ask a question of Grassley. Both were shouted at by others in the crowd. “I totally want health care coverage for everybody and some kind of national approach to it,” the woman said. Other people in the crowd booed. Grassley’s town hall originally had been scheduled in a small meeting room inside the Winterset Public Library, but it was moved outdoors to the park next door. 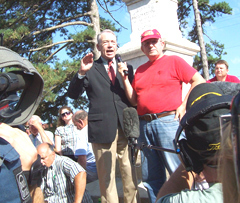 Grassley started by standing in front of a monument, talking to the crowd. A few audience members gave up their seats on the steps of the monument and Grassley stood there, elevated above the crowd. 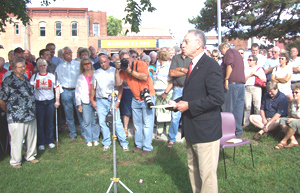 Nearly 20 minutes into the event, Grassley was handed a microphone connected to an amplifier so the entire crowd could hear his remarks. At the conclusion of the event, people continued to quibble with one another. “Read the bill!” one man repeatedly screamed as the audience filed away. Click on the audio link below to listen to the entire hour.